Smoothbore ALR Postal Match for September? Let's do a Postal Match this month with smoothbores instead of rifles!! I agree, Taylor. However, September would be better for me. I'm up for a smoothbore postal match in September! I'm in as well. Already used mine for the first shoot. Re: Smoothbore ALR Postal Match for September? Here's a link to the target, courtesy of long cruise & Dennis G.: http://americanlongrifles.org/PDF/ALR_25_yd_postal.pdf 5 shots, as per usual. Target looks good to me. Thanks for the link, Maven. 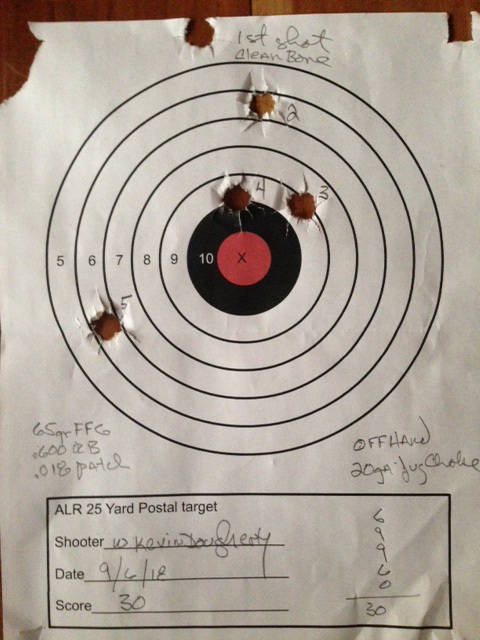 Here's PK's SB target: http://americanlongrifles.org/forum/index.php?topic=49705.msg500179#msg500179 Nice shooting, PK! Had a chance to shoot the September SB target today (in between the rain drops). Using 75gr. Wano FFFg, a home cast "pure" Pb Lyman .600" (.603" - .604" in fact) + milk carton OP wad + .018" pillow ticking patch, I was all over the practice target. I then dropped the powder charge to 65gr. and things improved greatly. Here's the record target, with a big whoopsie on the last shot (Those help keep you humble!) Btw, the gun is a Green River Forge 20ga. 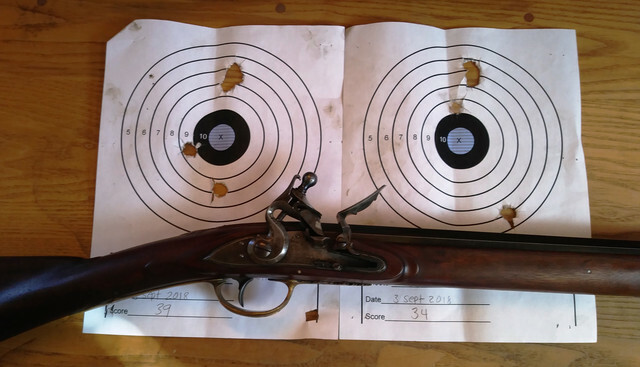 NW trade gun (flintlock). Bogey at 7 o. clock!!!! Don't I know it, SC! I will never have a target worth turning in however why not shoot for 3 months before switching to something else?I do enjoy seeing your targets and the discussion that goes with them. Hope to sight in a pistol today. I will embarrass myself with the smoothbore if I have time. Like looking at the targets. I'll be home for the October shoot likely. Was able to go shooting yesterday . fooled around with pistol for a few shots. Then Mr. Smoothie came out. Since Maven started by posting a practice target first I did the same. I had been given a pound of Dupont fg. Shot one out to right of target. I changed my left hand hold and shot five more. They settled in nice. I posted a clean target and shot five more. Over all I was pleased since I haven't shot the smoothie in three months. Score target on right. Load 70 grains of Goex 2f, 1/4 cushion wad, bare ball and A card. Conditions overcast variable wind 6 to 9 mph. I was sneaking up on it...then not. I went out to the range yesterday to shoot my September smoothy target. But someone has moved the 25 m target frame back to 37 yards. It is made out of grader blades and so I was unable to move it back up to 25. I tried to shoot it anyway, but my target was frustratingly non-competitive. I'll go out again next week, and take my own target stand this time. Where can I read up on the rules in case I get a chance sometime? It's supposed to be harvest time, and we are white over and freezing! Richard, the rules are simple: 5 shots offhand @ 25 yd. or the metric equivalent. 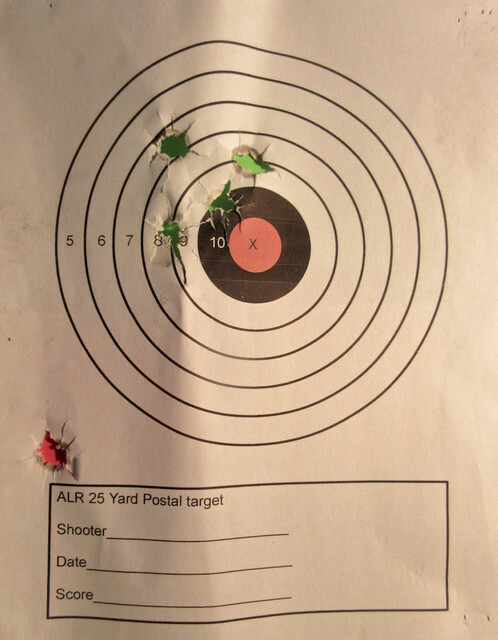 Here's a link to the target, courtesy of long cruise & Dennis G.: http://americanlongrifles.org/PDF/ALR_25_yd_postal.pdf Post a photo of your results in this thread and remember, it's just for fun. bragging rights, etc. For a while I thought that interest in the postal shoot had petered out. Happy to see that it is still alive. I don't really see this as a competition, but as an opportunity to go out and shoot with a purpose. I like to see what loads others are using. This is also a good time to try something you haven't tried before and see if it pans out. Like every shoot I ever go to, my pea brain is the competitor that I hope to beat. Too wet and snowy for harvest at present, but no ink in copier! Will just shoot at a regular target I have. If it's totally bad, I might just hide it! LOL. It's cold here too Richard. The day I went to the range to shoot, was brilliant sunshine and 2 C. The fingers get cold so easily now. We've had snow but it didn't stick. Finally got my September smoothy target shot the other day. I took my target board to our black powder camping field, and set it up, then measured back 25 meters, and put an empty water bottle down to mark the spot, right beside a fresh moose track. Auspicious beginning. 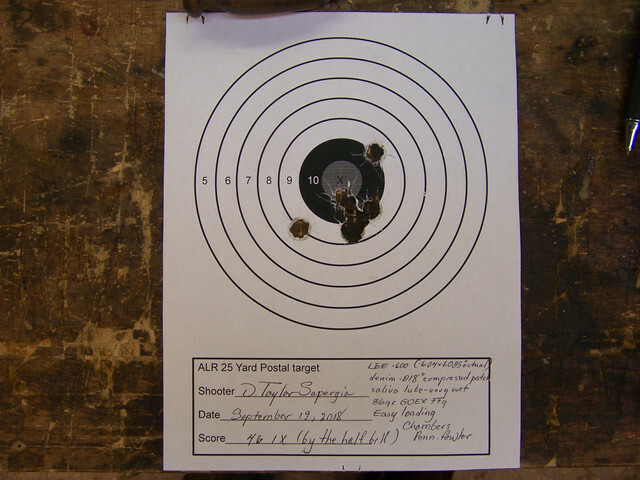 It's been about two years since I shot the old girl: Chambers' Pennsylvania fowler, and my warm up target showed it. But I persisted, and shot a target I was happy with, and present it here. My friend Don and I set up a trail cam on our trail walk in an spot where a bull had tor up the ground into a pisshole, and rubbed a sapling down to the wood. Hopefully we'll get some good pics of him in the coming days. The rut is just about to commence. That looks a fair dinkum target, Taylor!